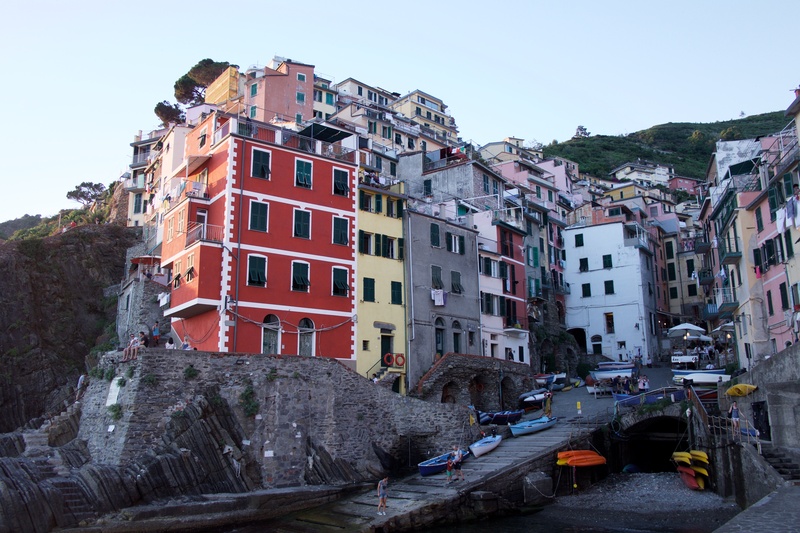 The Cinque Terre coastline is probably one of the most colourful and idyllic places I've ever visited, together with Prague's gorgeous city centre and the Venice canals (colourful Amalfi is still on my bucketlist). 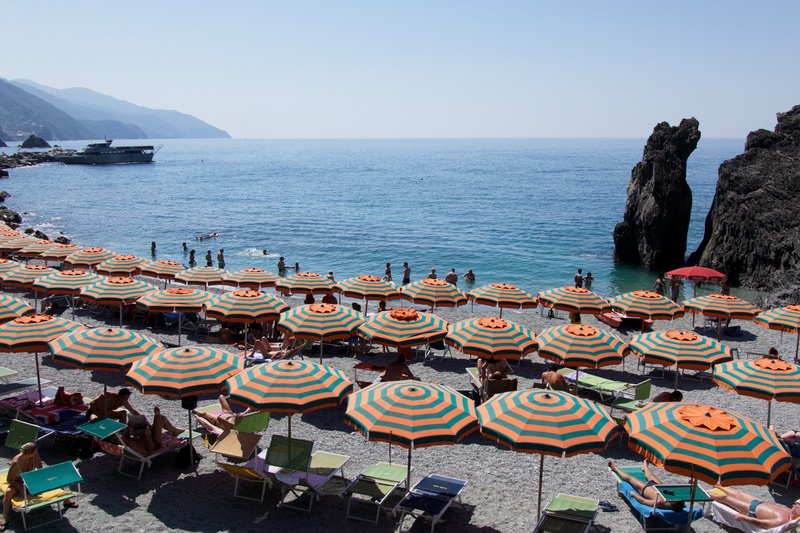 It's just that each of the five Italian villages has its own charm: Monterosso's beaches filled with colourful parasols, Vernazza's atmospheric harbour, Corniglia's cute streets, Manarola's photogenic position on the rocks. 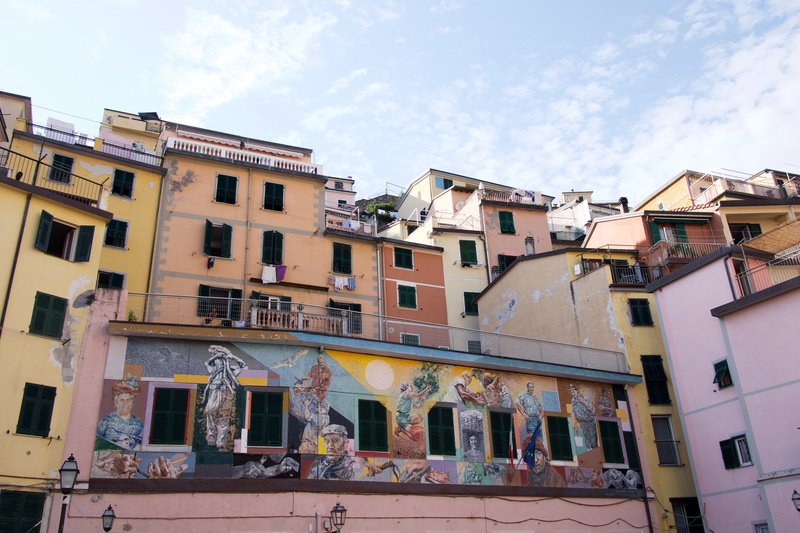 But only Riomaggiore (where we stayed for three nights) immediately stole my heart. Therefore on our last night we decided to skip the usual restaurant dinner setting to instead take away some pizza and Corona and watch the Sunset from the rocks. This Sunset situation is still one of my favourite memories from the Cinque Terre since pure and uncomplicated moments like this really make me feel happy and alive. 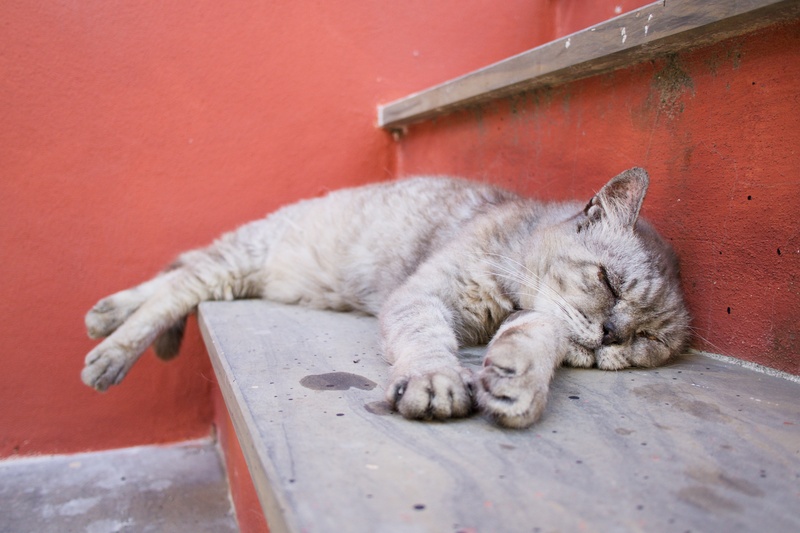 Also it was the perfect goodbye to three amazing days of exploring fairytale villages. 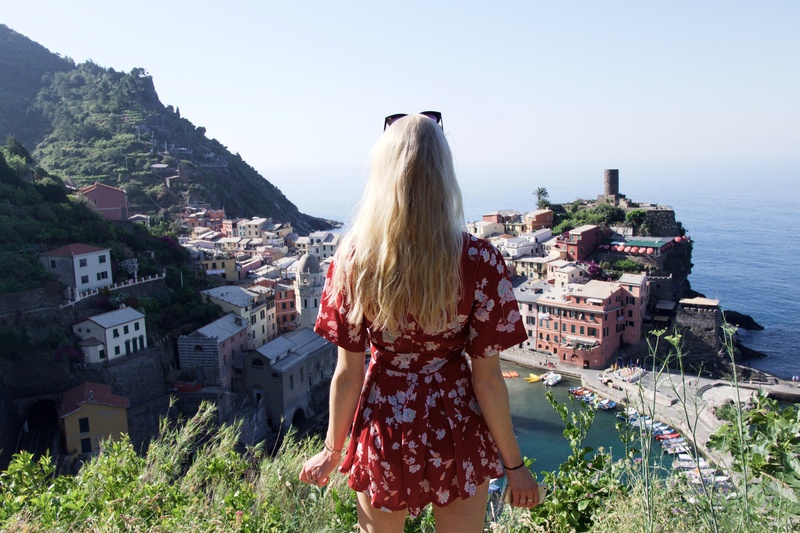 Anyway, two times we woke up extra early to avoid the daily tourist crowds during our Cornglia-Vernazza and Vernazza-Monterosso hikes along the coastline (the second one gives you the best views over Vernazza). 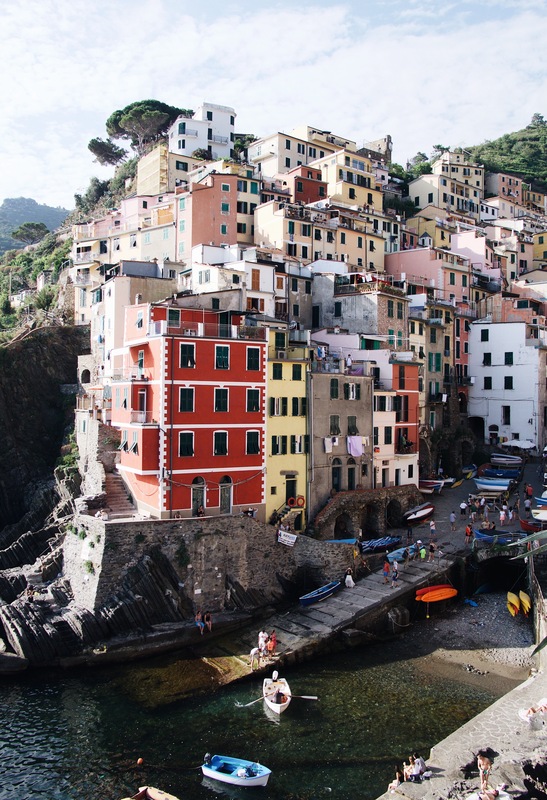 This made it possible to experience the Cinque Terre streets and hiking trails in peace and quiet, which made it a lot easier to take pretty photos - so I would say getting up early really does pay off! By the way, I would really recommend to take a taxi boat between the villages at least once. 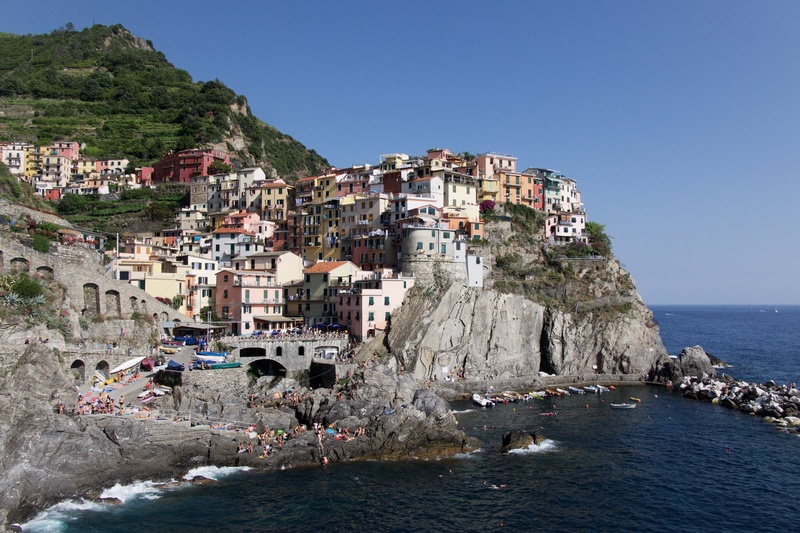 We took the Vernazza-Manarola connection and felt delighted while gazing at the beautiful coastline from the boat. Afterwards we had a super delicious seafood lunch which I will tell you all about in the below recommendations on where to eat. All together we truly had a blast during our days in Cinque Terre and I will certainly plan to visit again in the future! Instead of the usual fast food bites this places offers delicious crunchy (deep-fried) seafood for take away. 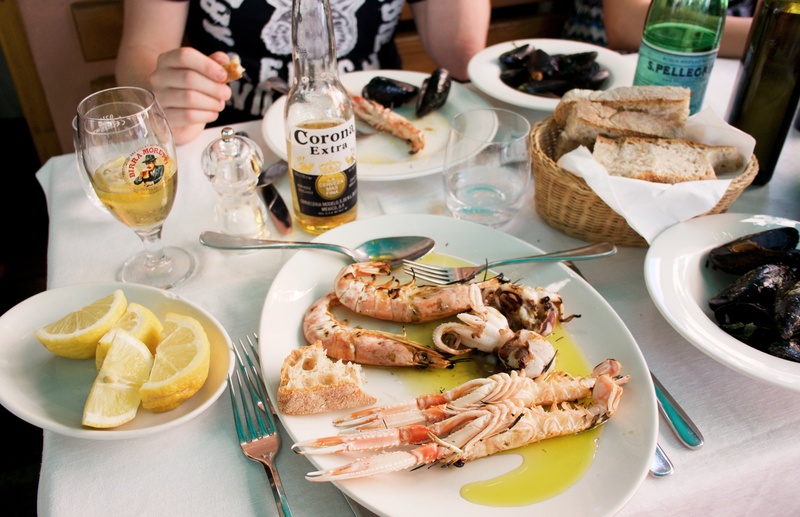 You can go for a big portion of one kind of seafood or just take the mixed one like we did: including shrimps, small fishes, octopus and even some vegetables - yum! 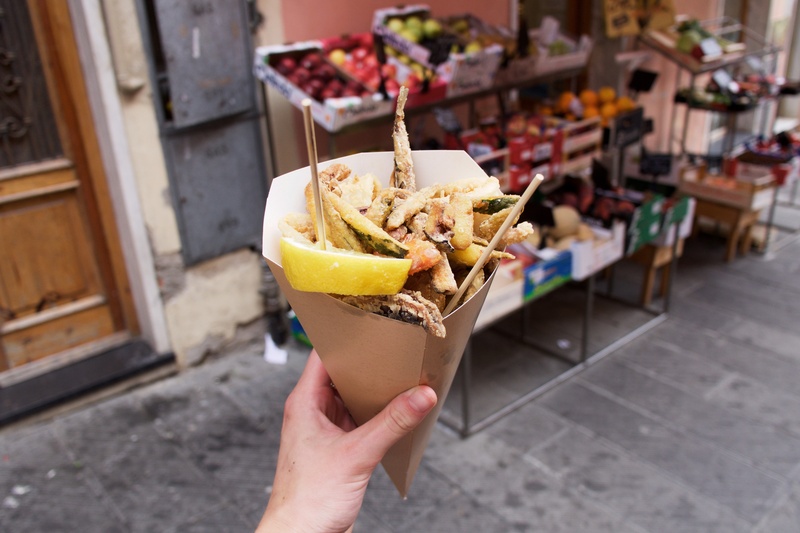 An affordable and tasty option in case you're travelling on a budget or just don't feel like heading for lunch in one of Riomaggiore's restaurants. The bar or terrace area of A pié de Ma is open all day long for small bites and vino, but the upper restaurant area only opens during the evening. Although the prices are a bit more high than average I would really recommend this place because of the experience and extraordinary, quiet location. We for example enjoyed a delicious homemade seafood pasta while overlooking the ocean and an orange sunset sky which felt really romantic. Important: make sure to reserve a spot because the restaurant only has a few tables. 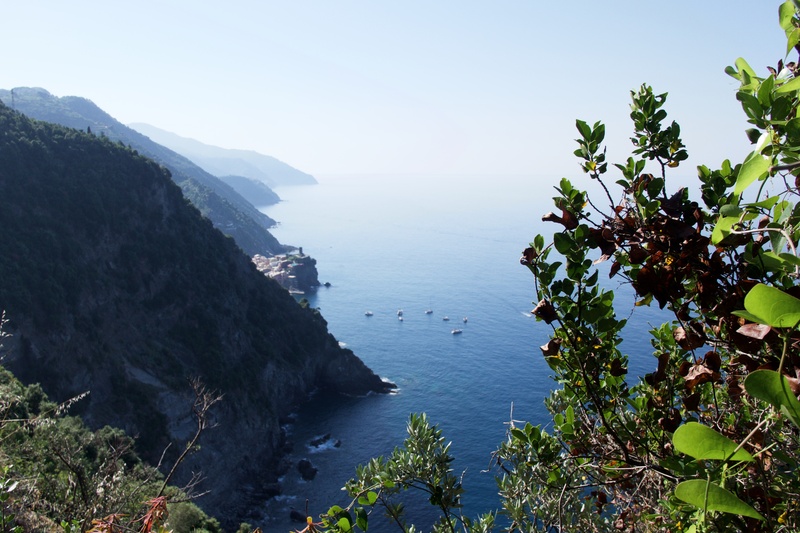 Treat yourself on a refreshing ice cream after a morning dive or hike from neighbouring villages Monterosso or Corniglia. Also make sure to take a cone because they were so tasty! Time for another ice cream! It would be such a waste to skip the ice cream of Il Porticciolo because the quality is really good. Also, another ice cream is always a good idea (no cones at this place though). My favourite restaurant out of all the places we visited in the Cinque Terre. Trattoria La Scogliera is located in the main street of Manarola, offers affordable and great quality seafood dishes and has a small but atmospheric terrace (where you can secretly observe and discuss all tourists who pass by - one of my favourite activities): the perfect place for a warm lunch or early dinner! 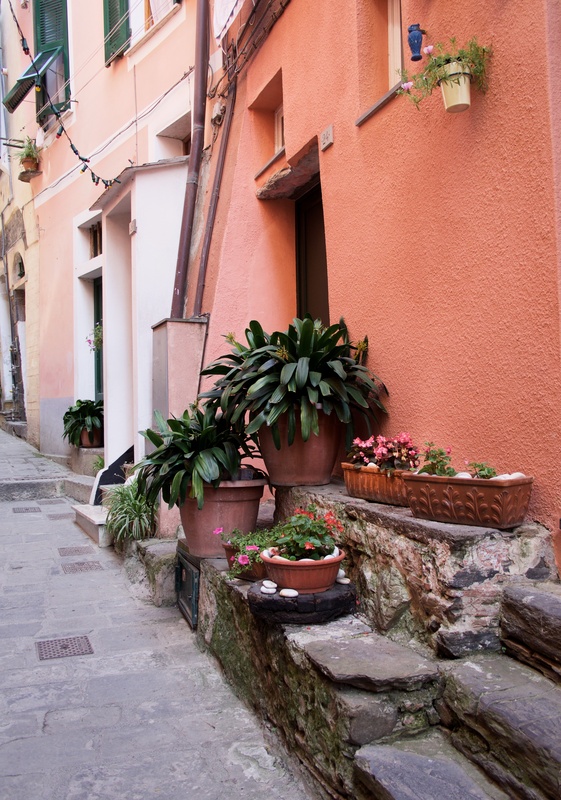 A yummy ice cream shop located in the old part of Monterosso. 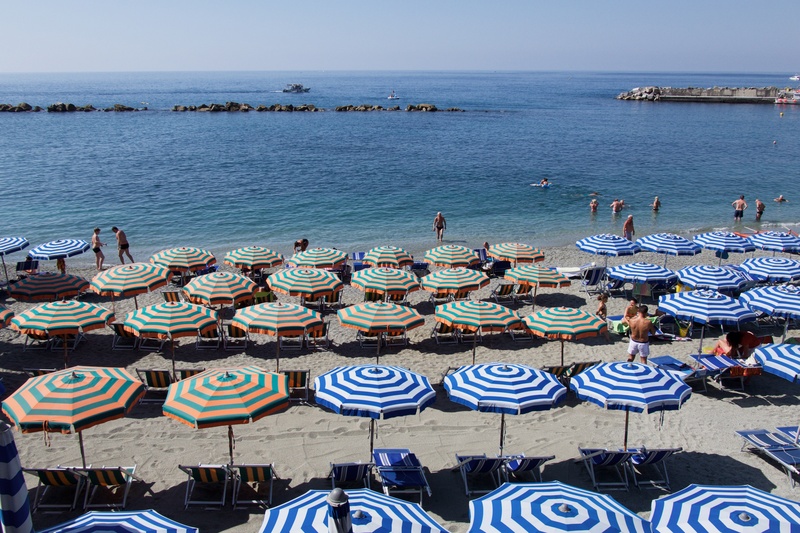 Gelateria Il Golosone is located close to the old town beach and therefore is the perfect place to grab a cold snack in-between your swimming or sun-bathing activities. This restaurant immediately caught our attention while on our hunt for a good place for lunch in Monterosso old town. 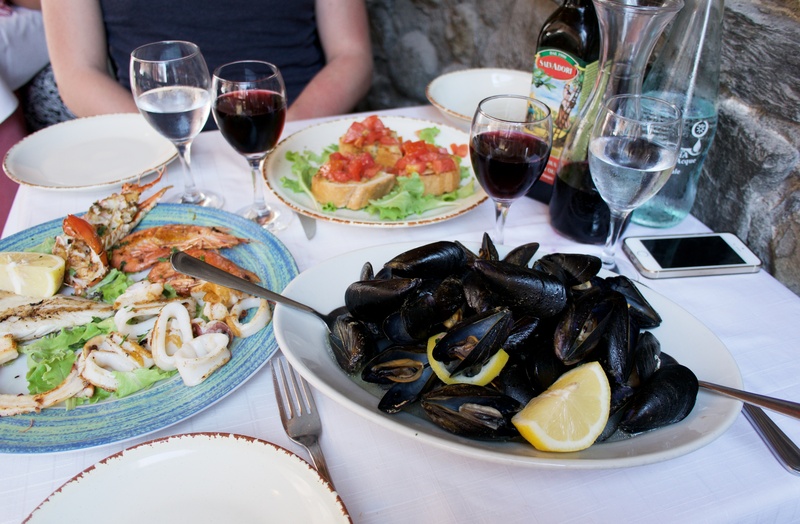 And our prayers were all being answered since we got to enjoy a delicious mixed seafood platter, mussels in white wine sauce and a refreshing Corona (like you can see above) - yum! 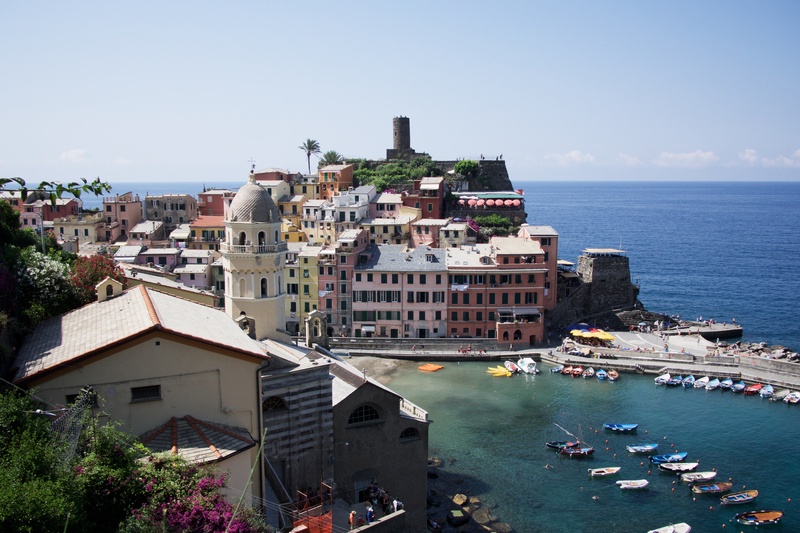 After we hiked all the way from Vernazza to Monterosso we were like the happiest kids when we took our first bite out of one of Il Massimo della Focaccia's delicious focaccia's. This place is truly the best bakery in the Cinque Terre area. You should definitely try their artichoke focaccia - its heaven!